If you're an airgunner you need to behave responsibly, safely and legally. Here's what the law says. Q: My ex-husband has told me that he intends to buy an air rifle for our nine-year old son. Does the law permit the use of airguns by someone so young? A: It is against the law for anyone under the age of 18 to buy or own an airgun or airgun ammunition, even if it is given as a gift. An adult aged 18 or over can, however, buy and own a legal-limit (sub12ft/lb) airgun and allow a child as young as your son to shoot under very close supervision on his or her own property or on land where they have permission to shoot. Some parents might regard this arrangement as buying an airgun for their child, but the airgun is owned, kept and controlled by the parent. Under-18’s must be prevented from gaining unauthorised access to airguns, or the owner will be liable to a fine. Store the air weapon in a lockable cupboard – keeping the keys separate and secure. Alternatively a locking device can be used to attach the air rifle to the fabric of the building or a fixed feature. In Scotland, you need an Air Weapon Certificate or a visitor permit to use, possess, purchase or acquire an air weapon. It is illegal to sell an air weapon or ammunition to a person under 18 years of age. It is an offence for any person to use an air weapon for firing a pellet beyond the boundaries of any premises. This includes a supervising adult who allows a person under the age of 18 to use an air weapon for firing a pellet beyond the boundaries of any premises. At what age can you use an air gun? You can use an air weapon under supervision on private premises with permission from the occupier – normally the owner or tenant. The person who supervises you must be at least 21 years old. You cannot buy, hire or receive an air weapon or its ammunition as a gift, or shoot, without adult supervision. Parents or guardians who buy an air weapon for use by someone under 14 must exercise control over it at all times, even in the home or garden. You cannot buy or hire an air weapon, or ammunition, or receive one as a gift. Your air weapon and ammunition must be bought and looked after by someone over 18 – normally your parent, guardian or some other responsible adult. You cannot have an air weapon in a public place unless you are supervised by somebody aged 21 or over, and you have a reasonable excuse to do so (for example, while on the way to a shooting ground). Is it illegal for my pellets to cross the land boundary? 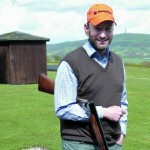 What are the rules on firing a shotgun or air gun pellet over the boundary? 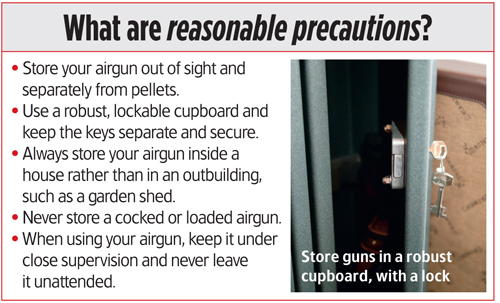 Keep your airgun under close supervision at all times and to never leave it unattended. Where you have no option but to put your air weapon down for short periods, unload it and gather up all the ammunition. Prevent anyone under the age of 18 from gaining unauthorised access to your air weapon – which might mean attaching it to a fixed object using a security cord or similar device, or locking it out of sight in a car. Never fire an air rifle unless the shot is safe (make sure a backstop or pellet catcher is used and nobody is nearby who could be in danger). Endeavour to make a stored air rifle incapable of being fired.